In the early 1990s, Asian Lady Beetles (ladybugs) become widely popular when they started infesting homes and other structures within the United States. In most instances, these bugs are considered to be beneficial as they feed upon pests that detrimentally impact outdoor plants; however, there are certain species of this insect that may prove to be a nuisance. This is because they will invade structures in an effort to discover overwintering habitats. Once the Asian Lady Beetles enter into a structure, they may then crawl in unwanted area, eliminate a yellow-colored fluid on the surfaces that they frequent, and may even emit an extremely noxious odor within the structure. If you are experiencing complications with Asian Lady Beetles, read on to learn more. Asian Lady Beetles are oval in shape, convex, and are approximately ¼ of an inch in length. Many are red in color, but, others may be orange. It is common for black spots to be located on the wings; however, many may have only small spots or none at all. Females typically have multi-spots, while males have less or none at all. These insects have very few natural enemies. Unfortunately, there are those that are infected with a fungus that could be lethal. Additionally, if disturbed, these insects could emit a yellow fluid from the joints of their legs. This may prove to be troublesome to many. Many die at extremely cold temperatures. Buildings are ideal to these insects – especially if there is a large amount of moisture and/or humidity in the area. Asian Lady Beetles are not the type of insects that typically harm humans. They do not reproduce within buildings. Unfortunately, these insects are a nuisance because of the odor that they emit and the stains that they leave behind. The fluids that come from Asian Lady Beetles could result in allergic reactions among humans – especially those that are prone to allergies. Many may suffer from irritations to the eyes, sinus drainage, and even the onset of asthma. The insect could bite, but, typically do not. If a bite is experienced, it feels like a very small prick sensation. There are a couple of steps that you may take to get rid of Asian Lady Beetles. You may vacuum the insects up or remove them by hand and take them outdoors. You may also seal any and all entry points in and out of your home and other buildings on your property. The best treatment, though, is professional pest control treatment. We here at All Pest Exterminating are trained to cover these types of infestations in a quick and effective manner. If you would like to learn more about the services that we offer, you may give us a call today. Our treatments are safe and will eliminate all types of infestations in and around your home. 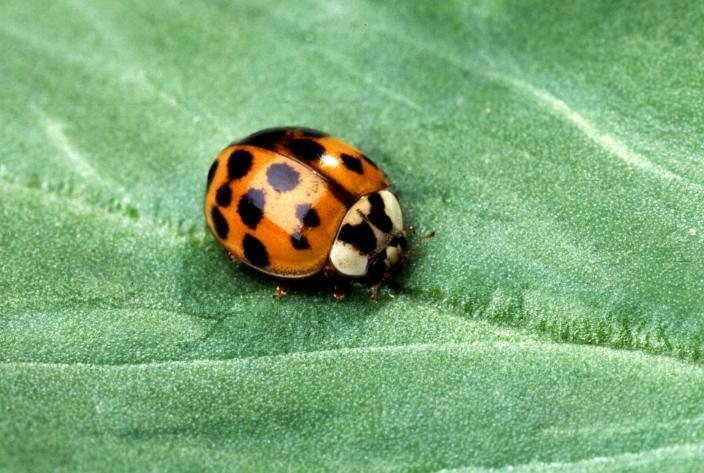 While Asian Lady Beetles may prove to be beautiful insects, they may be a nuisance.